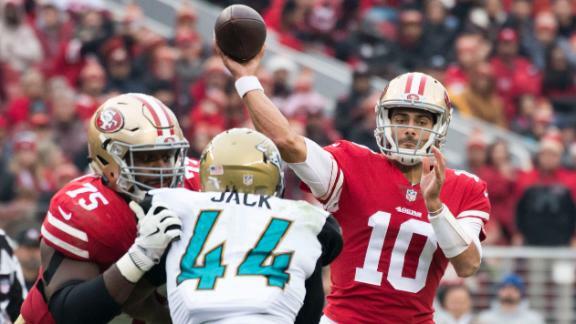 SANTA CLARA, Calif. -- Jimmy Garoppolo threw two touchdown passes and ran for a third score against one of the NFL's stingiest defenses and the San Francisco 49ers won their fourth straight behind their new quarterback, beating the Jacksonville Jaguars 44-33 on Sunday. The day wasn't a total loss for the Jaguars (10-5), who clinched their first division title since 1999 earlier in the afternoon when Tennessee lost at home to the Rams. But the defeat dealt a big blow to Jacksonville's hopes for a first-round bye. The Jaguars need to win next week and hope Pittsburgh loses twice to get a bye. He has led San Francisco to four straight wins but this one might have been the most impressive, considering the quality of Jacksonville's defense. The Jaguars came into the game having allowed the fewest points and yards passing in the league, while recording the most sacks. Blake Bortles threw three interceptions for the Jaguars, including one returned for a touchdown by Dontae Johnson in the first half, after going three straight weeks without one in the best stretch of his career . Bortles threw for 382 yards and two touchdowns but it wasn't enough for the Jaguars. Jaguars left tackle Cam Robinson (abdominal strain) and linebacker Blair Brown (concussion) left the game in the first half and didn't return. Jimmy Garoppolo throws for two touchdowns and runs in another in San Francisco's 44-33 victory over Jacksonville.